Bespoke custom-made formalwear tailoring business for both menswear and womenswear. Collaboration of London College of Fashion (LCF) graduates (BA Hons). Our principle designer, born in Italy, studied at Politecnico di Milano in Fashion (BA) is classically trained and finished her studies in Product Design and Development at LCF. She is not only an expert illustrator but also a true artist in that her inspiration not only stems from her passion in fashion and her love of music working on MTV projects, enabling her to have insight to street styles and pop culture mixes. One Partner of the business, Asian born and raised in London. At LCF she learnt tailoring and corsetry. Following her graduation she concentrated her knowledge in garment construction and fit, working for couture bridal companies. She has a diverse knowledge of the Asian market, creating contemporary fusion designs and has exceptional knowledge in embellishments. The other partner, born in Hong Kong but raised in England did not have the typical background in fashion. Before graduating at LCF he attained his experience in commercial roles following his degree in IT, working in Project and Supply Chain Management. 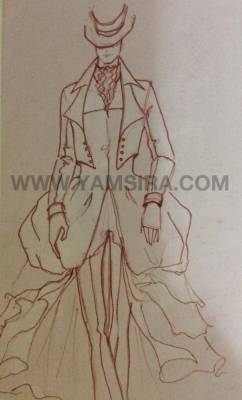 Whilst studying his fashion degree he also learnt tailoring and corsetry. He has an innovative mindset and researches into technological fashion advancement. He has also styled many bridal events and created bridal and groomsmen attire. All three have multifaceted connection to different types of industries, opening opportunities to various types of work. We are looking for varies types of models including older to qwerky, different shapes and sizes and particularly interested in androgynous looks. Include a clear face and full-length photo with your stats.